Rainy Bay Art: How do you keep it from erasing? How do you keep it from erasing? Here's a photo tour of my process. The first step is to coat the glass with the aluminum powder. This is the messiest part, of course, but I want to be sure to have enough powder to completely coat the glass. I do this over my "working" Etch-a-Sketch so that most of the excess goes into the Etch-a-Sketch and not all over the workspace. After the glass is sufficiently coated, I fit the red frame on and put knobs on, and do my drawing as usual. Here you can see the completed drawing to the left. I'm preparing the clean Etch-a-Sketch on the right. It's not pictured, but I remove the knobs and frame from the completed drawing. After removing the knobs and outer red frame, there's a brown inner frame that holds the glass. I remove this and pull out the stylus mechanism and strings so that turning the knobs won't draw any more lines. The brown frame is then replaced. 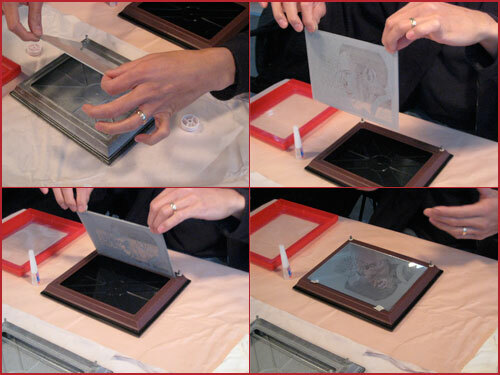 I take the glass (with the completed drawing) from the working Etch-a-Sketch. As you can see from the last photo, the working Etch-a-Sketch is entirely coated in powder and the brown inner frame appears silver. 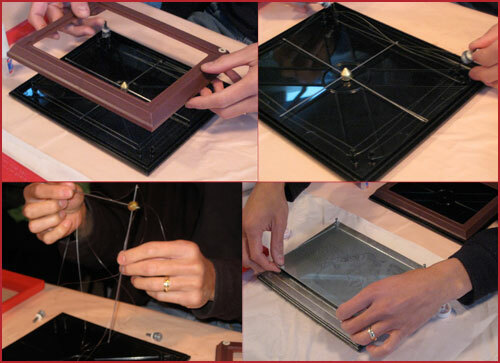 I carefully transfer the glass to the clean Etch-a-Sketch and set it in place, and then clean the outside of the glass of any stray powder. I replace the clear plastic protective sheet over the glass. Then I superglue the red frame on, and then the knobs. 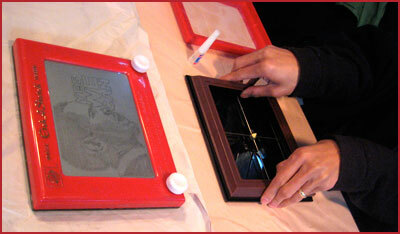 After clamping the entire assembly together to allow the glue to dry, the Etch-a-Sketch is a permanent piece of art. (I also screw in some rings for picture wire on the back for hanging.) Voila! 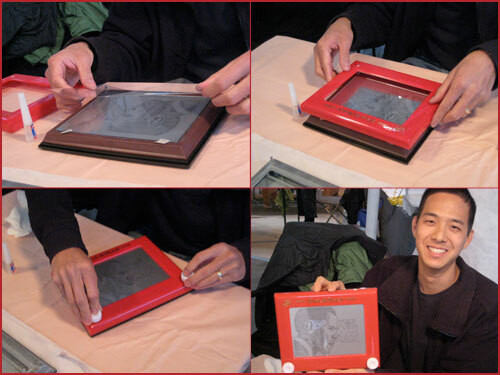 An Etch-a-Sketch drawing you can shake without fear of erasure. Thanks to Ian Thompson for taking these photos during PULSE 2008.